At an early age he moved to Beijing with his father. Poor health set him on a search for a good taiji master. Initially, he studied Wu Style Taijiquan from Master Liu Musan in Beijing. Master Liu was a famous Wu style teacher at the time. On hearing the news about a Chen Village master teaching in Beijing, Master Liu decided to invite him over for a demonstration. What they saw was Chen Fake’s demonstration of Chen Style second routine Paochui. No body could understand it, including master Liu. The execution of the moves was too fast, according to the popular understanding of Taijiquan at the time. However, master Liu had the foresight to decide to learn the forms from Chen. After master Liu and his students finished learning the first set of the Chen form, they decided to ask master Chen to teach them push hands. Master Liu told the students that push hands is the real test of taiji skills. In order to teach it, master Chen would be forced to demonstrate his skills. If he failed, all students would keep the story quiet and continue with their Wu Style learning. If otherwise, everyone would continue to learn from master Chen. 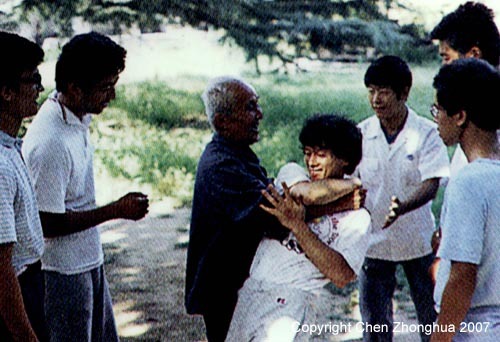 Master Chen Fake decided to show the principles of Chen Style push hands with master Liu Musan. On initial touching, the students already saw the difference. Master Liu acted like an invalid infant. He could not hold his stance. Master Chen declared that he would within one minute put master Liu in a chair that was situated far away from them in the corner of the courtyard. Master would fall into the wicker chair. If the chair fell down, or master Liu fell down outside of the chair, Chen would admit defeat. This was an outlandish claim. Chen Fake was not talking about ability to fight at all. He was talking about precision only. That was how proud he was of his skills. 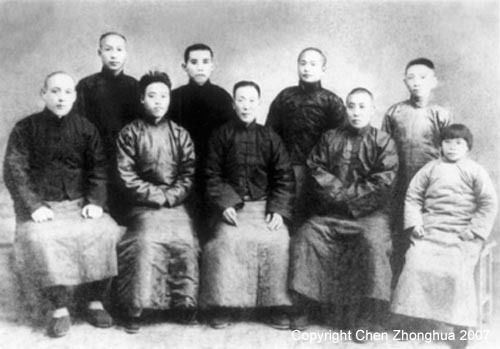 His every claim came true so in 1930, master Hong Junsheng, together with his master Liu Musan and his fellow students, became a student of Chen Fake in Beijing. He stayed on to learn the details of the entire Chen Family Taiji curriculum from Chen Fake for 15 years. As a result, he became a very healthy person with profound Chen Style Taiji skills and understanding. 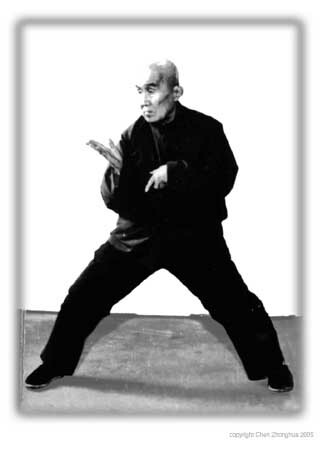 His Chen Style Taiji had the characteristics of looseness, roundness, spiralling, continuous, powerful and holistic. He very much possessed the personal style of his master. In 1956, he went back to Beijing for further training from his master. Every time he asked his master about an application of a technique that he was using, the answer was always, “Yes”. He tried every technique and every move of the whole system with his master and was corrected or accepted one by one. When he went back to Jinan, he continued to teach the curriculum that was approved by his master. He continued his research. He experimented with students, friends and other martial artists. Through the years that ensued, his understanding of Chen Style Taiji became profound, and his student population also increased. Hong was the only person to study under Chen Fake for 15 years consecutively. 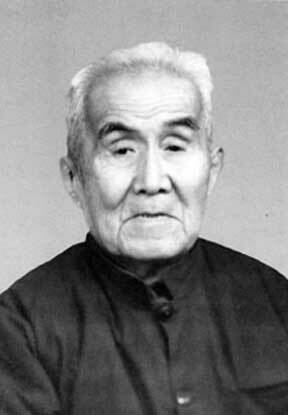 He was regarded by some to be a living resource person on Chen Fake’s life and his teachings. Most of the stories about Chen Fake originated from him. Hong was a very learned person. He read extensively and had an amazing memory. He was an expert of “temperament” (study of the rhythms of Chinese poetry) and was a poet and calligrapher. In his Chen Style Taiji research, he combined philosophy, physics and logic into his experiments. He followed his master’s habit of using everyday life analogies in his explanations of the principles, theories and techniques of Chen Style Taiji. He was an enlightening master. He was traditional in keeping the art yet modern in keeping up with the times. He used common terminology in his teachings so that the layer of mystery is removed so easier understanding of the art from today’s background. He refused to use words such as “qi” in his teachings and his writings. Yet anyone who personally experienced his push-hands knows that he was a man who reached a very high level of ability even in the eyes of “qi” masters. Hong had a hard life and spent half of his life in poverty. His only ambition in his entire life was to carry on his master’s art. His life time persistence in the art brought to his door step students and visitors from all over the world including many from Japan. For many, to personally visit with this “sage” was an event to remember for life! During the last few years of his life, he was honoured with titles such as chairman of the Jinan Municipal Martial Arts Association, and senior advisor of the Jinan Martial Arts Academy, advisor to the Shandong University Martial Arts Association, and was a member of the Jinan Political Consultative Conference. He published many books including “Chen Shi Taijiquan”, “Chen Shi Taijiquan Shiyong Quanfa (Practical Chen Style Taijiquan)”, “Chen Shi Taijiquan Techniques”, and “Interpretation of Taijiquan Treatise of Wang Zengyue”. 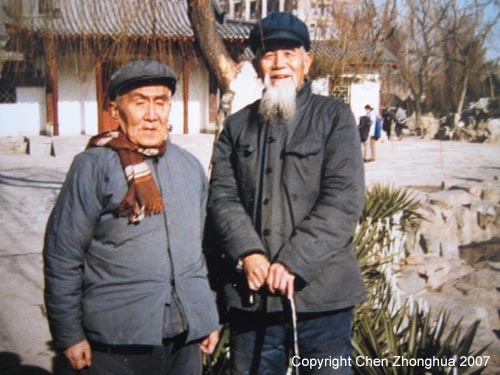 In 1994, he was working on his last book, “Comparisons of Characteristics and Methods of the Five Styles of Taijiquan”. The book was completed but not published. 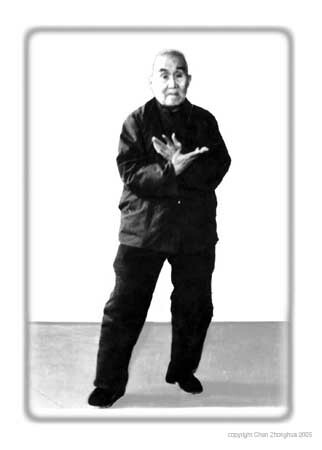 He started teaching this form in Jinan in 1956 till his death in 1996. He was devoted to this one art for 56 years. This single-minded devotion made him of the most important authorities in Chen Style. Many other famous masters such as Gu Liuxin and Chen Zhaokui often sought his advice. He became a leading source of information in the style as well. To me, his most achievement is that he strictly followed a Taiji/Daoist way of life. This is the most difficult thing to achieve for modern people. He never worked in his life and only taught Chen Style Taijiquan. His life was totally dictated by Taijiquan. Even during his last days, in bed because of food poisoning, he insisted on pushing hands with disciples. He is one of the few masters in the 20th century who achieve little reputation by huge ability. Those of us who were privileged to have learned from him are indeed lucky people. In these day and age, it is almost an impossibility to have pure martial art without the influence of any politics. newest theories in physics about the structure of the universe – double torus. The energy travels in a 3D spiral through a fixed point – a black hole. For this to happen it needs a fixed geometry named “vector equilibrium”. Another characteristic of such a structure is rotation and revolution. This structure is the same at the atomic level and at an astronomic level. of universe including I Ching. Somehow it is related to this. It’s all about circulation of energy through geometry. But is completely revealed to me”. nothing about this. Of course, because it is a different method. The fight is to adhere to these principles, to become something else. which I would have understood nothing from the book. Everything about theory. The rest is practice of the body . To discover this was a great lesson of humility for me . Even in a thousand years I could have never imagined such a thing. Never. Amazing man and amazing life! for those who never met him. (2) a byproduct phenomenon that was never part of Taiqi proper in the first place? understand and control the energy involved in a fight. We have the proof.